If you use a flat iron to straighten or smooth your hair and you’ve noticed it’s not working like it used to, that may mean it needs a good cleaning. It’s important to understand how to clean a flat iron. Hair products such as conditioners and styling products can cake up on the plates and reduce their effectiveness. 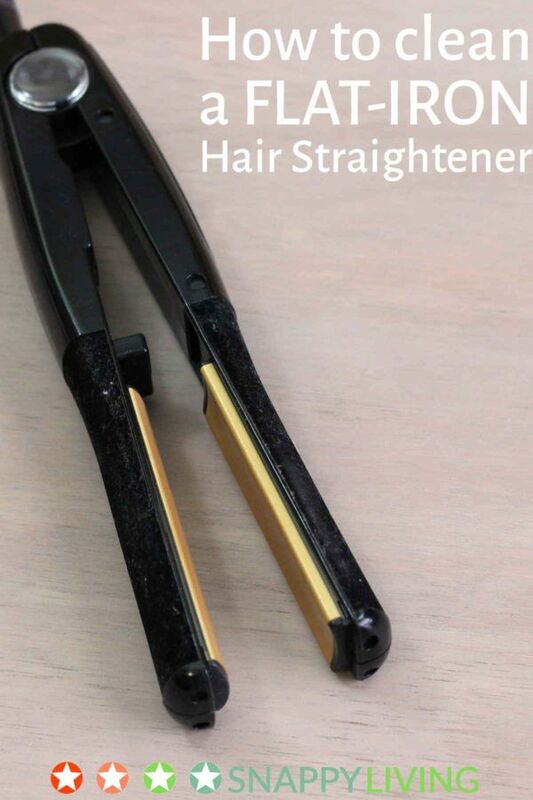 They can also potentially cause the flat iron to damage to your hair because the baked-on products turn into crusts that grab onto your strands as you try to pull the iron smoothly through. Fortunately, cleaning your flat iron and restoring its original effectiveness is easy. It doesn’t matter whether your iron’s plates are made of ceramic, tourmaline or whatever – these tips tell you how to clean a flat iron, no matter what it’s made of. Any material that works as a hot surface for straightening hair can be cleaned with the following method. Turn off and unplug the flat iron immediately after use. Put it on a heat-resistant surface – I have a glass counter saver on top of the dresser in my bedroom for hot tools. Let it cool down until it’s still slightly warm, but very comfortable to touch. Dampen a textured cloth such as a dish towel or washcloth with water. Gently run the damp cloth over the plates, especially where you can see grime. Don’t press or scrub – just keep running the cloth over the grime gently until it comes off. You can use other parts of the cloth to clean the rest of the wand. Plastic areas can be scrubbed if needed. If there are any tight spots with grime in them, a damp cotton swab can be used to get in there and clean it out. Be sure you let the iron dry thoroughly before you use it again. If water isn’t working, you can use alcohol to remove the baked-on grime. Some people will tell you that you must use a product marketed for cleaning hair styling tools, but the main ingredient in those products is simple alcohol, which is all you really need. You may also want to learn how to clean a hair dryer, to keep that tool working at maximum efficiency, too. How often you’ll need to clean your tools depends on the styling products you use and how much time you spend straightening your hair. If you have thick curly hair and have to go over every strand of it several times every day, you will probably need to clean your iron 3-4 times a week. If you’re just straightening your bangs, once a week might be plenty. You just have to watch your tools and notice when they’re either not working as well or you can actually see build-up forming. If you notice that it takes about 3 days to start getting like that, I would suggest cleaning it every other day to prevent it not working so well on the third day. If it takes ten days, then cleaning every nine days (or once a week, if that’s easier to remember) should keep your iron in great shape. I have tried just using a damp towel and putting some scrubbing action to it. I have even tried using soap and a dish scrubbing pad. None of that has worked. Does rubbing alcohol work as well? Or should I buy some flat iron cleaning product? I haven’t tried alcohol because the damp paper towel works for me. Alcohol should work for cleaning, but it can cause surfaces to become brittle over time. I have no idea how various straightening iron plate materials react to it. I just read where you get the iron a little hot but not too hot to burn yourself then wet a wash cloth with rubbing alcohol to clean. I haven’t tried it yet but plan to. I tried rubbing alcohol and it doesn’t work. I’ve also tried heating the iron first and it still doesn’t get the crud off. HELP! Andrea, are you sure it’s crud? Sometimes some of the plating wears off a flat iron over time, and there’s nothing you can do about that. If alcohol won’t take it off, I don’t know what else to suggest. I’ve tried baby wipes, works great as long as I don’t wait until there’s too much crud. Baby wipes and my finger nails under the baby wipes. Takes some scrubbing action as with other methods but does work. Try to keep it clean regularly that way you don’t get the ‘crud’ build up. I experienced this same problem and my hairdresser told me to heat it up, unplug it, spray some Windex on it and wipe it off with a cloth! It worked beautifully!!! Thanks for the tips I will have them when I clean my plate Karimin.